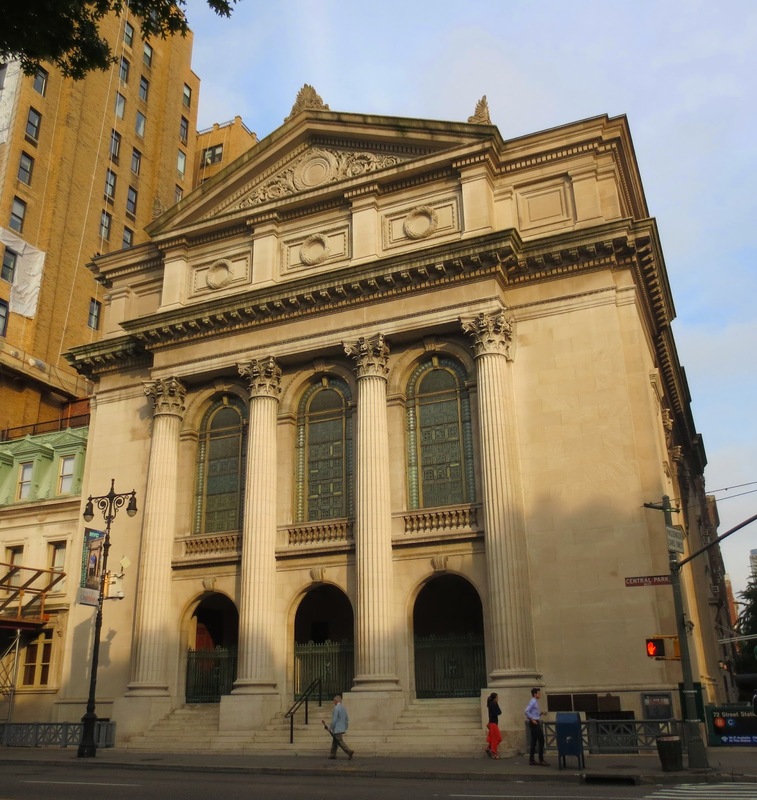 The beautiful masonry building in neo-classical style, the present home of Shearith Israel congregation sits in the middle of the Upper West Side historic district. The New York metropolitan area now is home to the largest Jewish population in the world outside Israel. In 2012, more than 1,100,000 Jews lived in New York City (about 12% of the city's population). 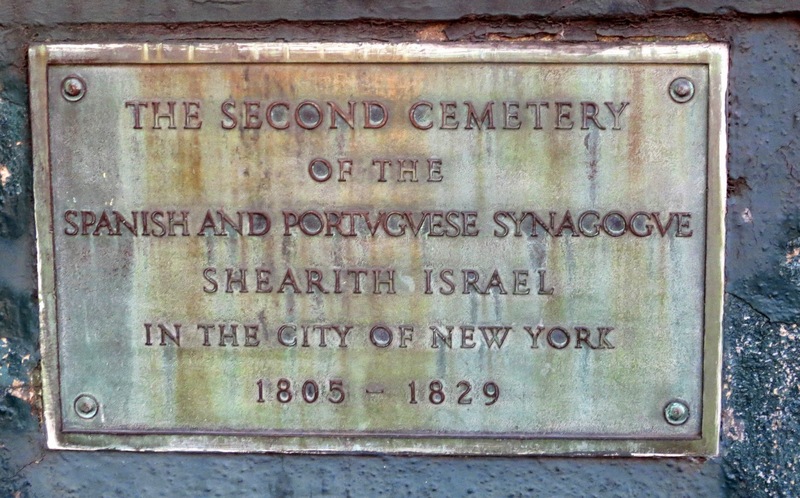 The first Jewish community Shearith Israel was founded in North America in 1654, when New York had the name New Amsterdam. The story behind this community started centuries ago, in 1478, when King Ferdinand II of Aragon and Queen Isabella I of Castile established the Spanish Inquisition. On April 30, 1492 Spanish King Ferdinand ordered all Jews to leave Spain by the end of July. Jews gradually migrated throughout Europe , North Africa, Central and South America, including Brazil (under Dutch rule at this time). When Columbus sailed from Spain on August 3, 1492, there were several Jews among his 120 men. Luis de Torres, a Jew from Murcia (south-eastern Spain), served as Columbus’s interpreter . When the ships arrived at Cuba, Luis de Torres decided to remain in Cuba. But at that time he was the only Jew in North America. In February 1654, a month after Portuguese reconquest, the Dutch schooner Valck,one of the two remaining vessels carrying Brazilian Jewish refugees sailed out of Recife, Brazil. En route it was captured by pirates . The pirate’s captain forced the ship to land in Jamaica( Spanish colony at that time) , and expropriated all of the passengers’ possessions. Some Jews were even incarcerated by the local Inquisition. The remaining 23 Jews who were not jailed were allowed to depart. When the journey continued, the group stopped on the western tip of Cuba and then was taken by the French ship St. Catherine to the Dutch colony of New Amsterdam, where they arrived in September, 1654. 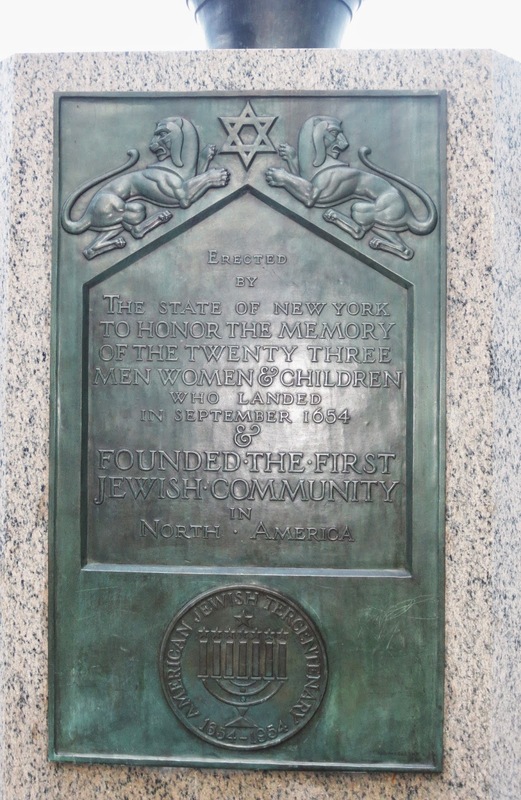 This flagstaff, unveiled on May 20, 1955 at Battery Park in Downtown commemorates the 300th anniversary of the arrival of the first Jewish settlers in New Amsterdam and North America. Stuyvesant, Dutch Director-General of the colony of New Netherland objected to any settlers who were not members of the Dutch Reformed Church. He attempted to evict the Jews, but Jewish stockholders in Amsterdam prevailed on the Dutch West India Company to order the narrow-minded governor to let them remain. Stuyvesant attempted to establish a discriminatory regime ,but the Dutch West India company instituted a rule allowing Jews to own real estate, trade freely, and be spared discriminatory taxes. Seeing the ominous British power on both sides of the Dutch colony, the Jews gradually left in the 1650s. They went directly to Holland or to other Dutch colonies, including Curacao and St. Thomas . 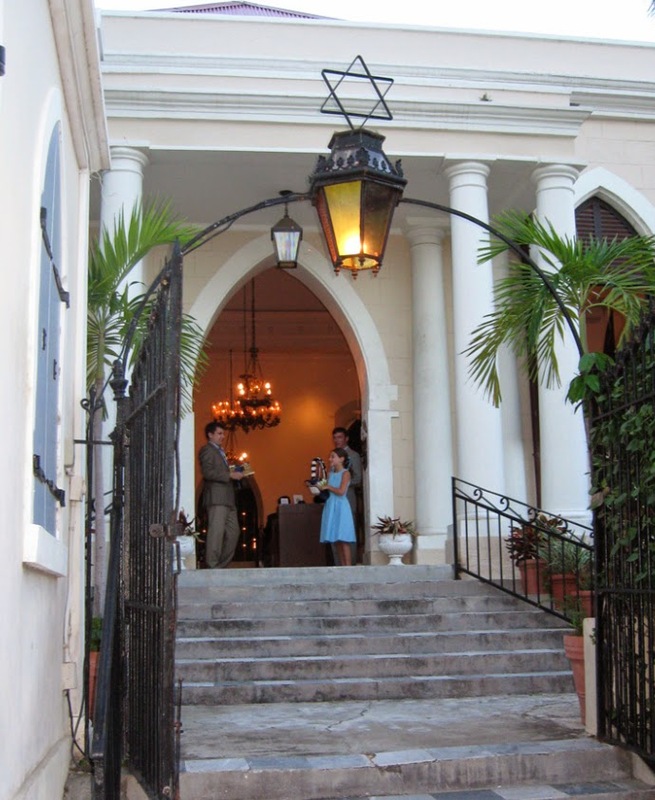 The Synagogue in St. Thomas is the oldest synagogue in continuous use under the American flag. Famous Jews born here include French Impressionist painter Camille Pissarro and David Levy Yulee, Florida’s first senator. 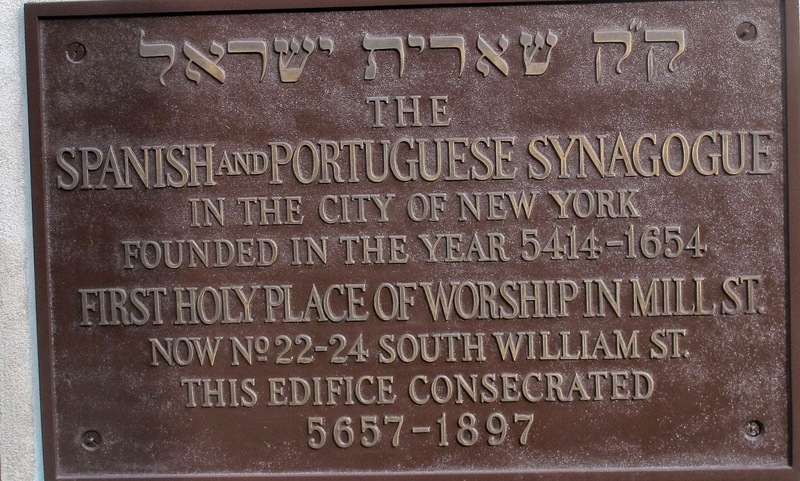 In the early years in New York settled near Whitehall Street and later they moved to Mill Street, which was later called “Jew Street.” On Mill Street(South William street now) , they built their synagogue in 1728. The New York Jewish community continued to grow with new immigrants attracted by the opportunities the port city offered in commerce. 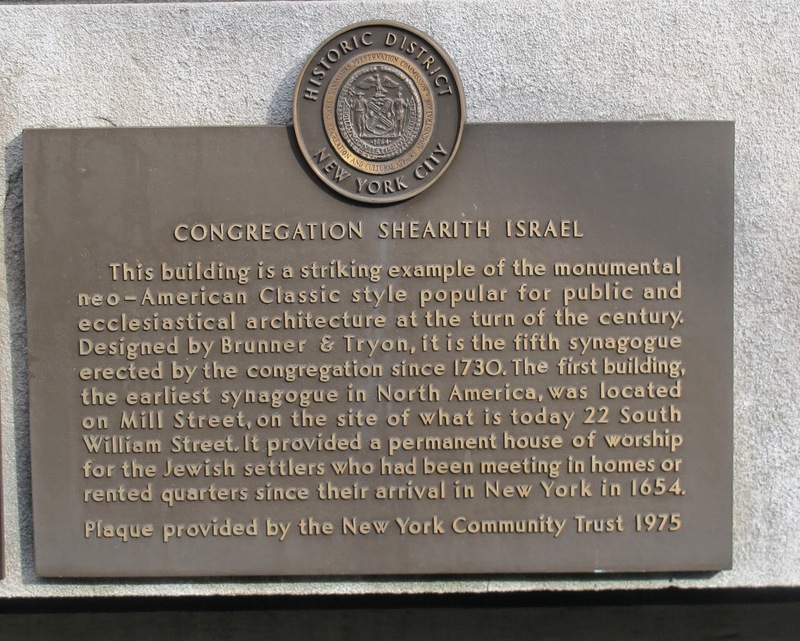 On April 8, 1730, Congregation Shearith Israel, in New York, America’s first synagogue, consecrated its home, the first structure custom-built for a Jewish house of worship in the country. 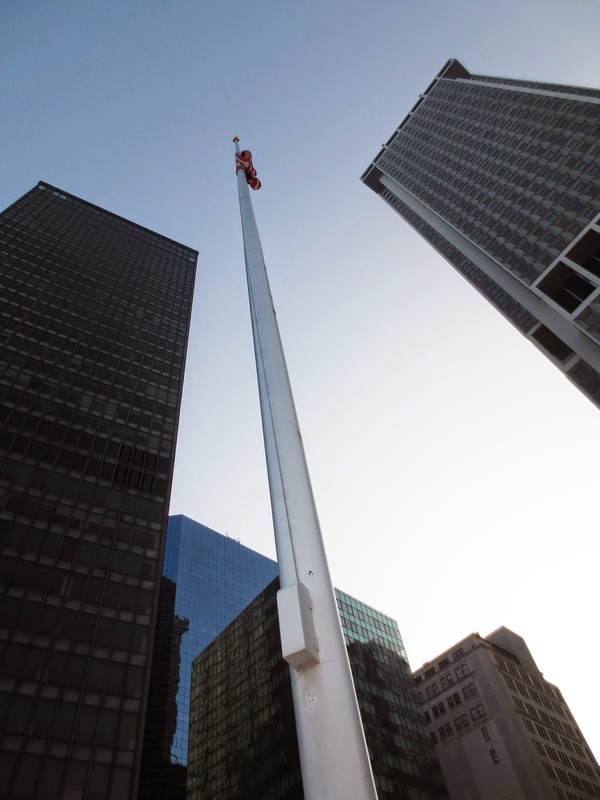 The small building, on Mill Street – what is today South William Street, in the Wall Street area of Lower Manhattan – was dedicated on the seventh day of Passover. First Cemetery of this congregation, dates back to 1683, is in what is today Chinatown. The Second Cemetery is hidden behind the blue wall and wrought iron fence on West 11th Street. It caught my attention during a recent walk in Chelsea. Burials began here in 1805, in what was a much larger, square plot. 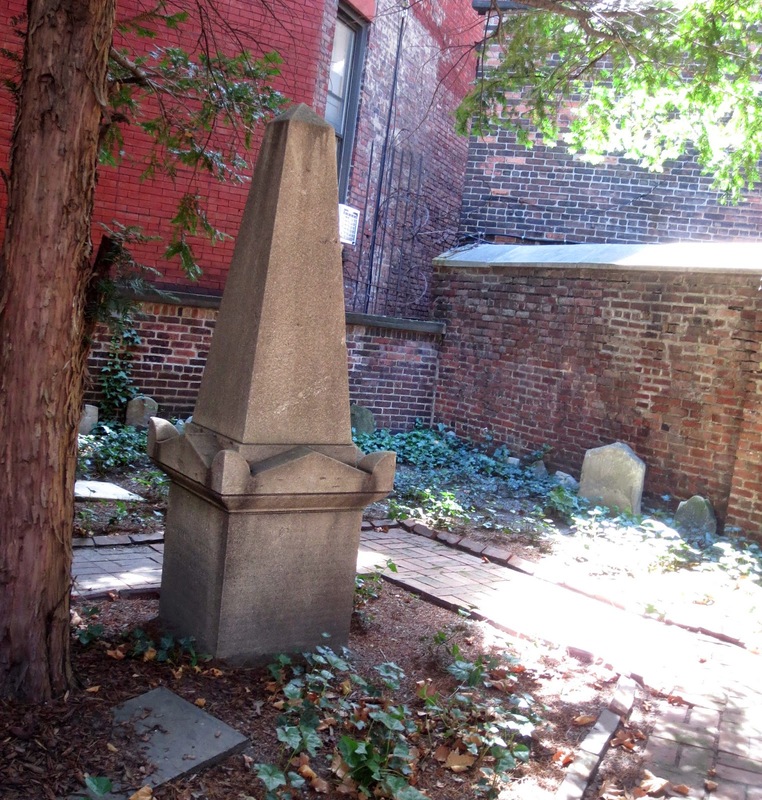 In 1830 was West 11th Street cut through, reducing the cemetery to its present tiny triangle. The disturbed plots were moved further uptown to the Third Cemetery on West 21st Street, and later when in 1852 city law forbade burial within Manhattan, subsequent interments have been made in Queens. 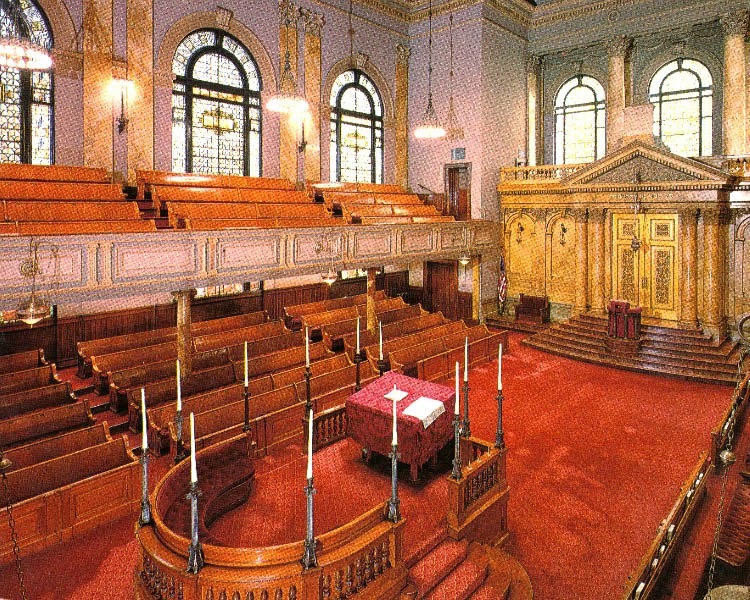 The present synagogue building, on 70th Street and Central Park West, is the fifth which The Congregation has occupied. At the entrance to the synagogue, there are two millstones that were from Mill Street, the location of the town miller during the early colonial period. They were taken from the site of The first Mill Street synagogue as a reminder of The historic roots in the city. 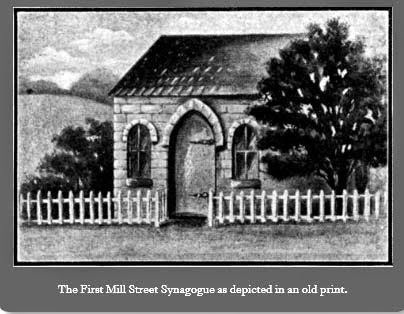 There is a replica of The Mill Street synagogue—the Little Synagogue inside the building. The reader's desk and the four candlesticks surrounding it are also from the Mill Street synagogue.